BYOD strategy revealed at LONAP board meeting. Lonap held its regular board meeting on Wednesday at Will Hargrave’s house. These are very long days but worthwhile. We have a lot of stuff to plough through. LONAP operates a BYOD strategy. The IXP is very leading edge especially when it comes to HR and IT. 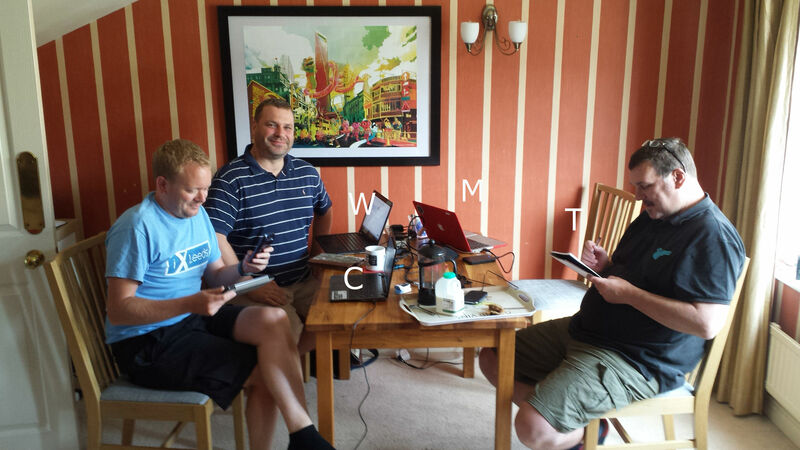 The featured image illustrates the byod strategy at work showing Will, Andy (Davidson) and Rich (Irving) sat around the board table in front of the various notebook computers. Andy is a Microsoft guy. He has a Windows computer with a touch screen Needs to be to get the most out of Windows 8 or so I’m told. Will is an Apple fanboi. He is actually sat in front of my Chromebook but you can see his Mac on the table next to Rich. The various makes of notebook have a white letter near them to denote flavour. Rich has a letter T next to his. That’s because his notebook is made of tree. It’s quite nifty. Comes with its own advanced carbon based stylus which has a neat way of erasing mistakes. The stylus has a soft plastic top to it which when moved back and forwards across the lines on the page left by the carbon erases the carbon marking, or most of it anyway. Tree based notebooks aren’t perfect but nobody expects the finished goods so early on in the product lifecycle. The stylii for example still have some way to go. The sharpened front end does have a tendency to break although Rich seems to have mastered the art of applying just the right amount of pressure to avoid damaging the tip. These stylii do represent a marketing opportunity to sell accessories. The product team must have all worked at Apple at some point in the past. They seem to know their stuff. Available for purchase are a sharpening device (v handy in the post 9/11 security conscious world of the global internet executive) together with a nifty case that can hold multiple stylii. Rich pointed out that you can get them in a huge range of different colours. They also sell storage containers known colloquially as bookcases. These are also made of carbon although like in any market there seem to be cheap imitators on sale made of something called MDF. Being a fan of cloud technology myself I did ask Rich whether there was a virtual version of his Tree technology. He mentioned something about Carbon offset which I didn’t completely get and not wanting to look stupid in front of the others I kept shtum. There’s bound to be a cloud version available or at least coming soon. Readers looking to implement their own byod strategy should at least take a look at Tree technology when considering notebooks. The one at the LONAP meeting certainly had a nice feel to it. They have the weight just about right and Rich says it is totally customisable. You adjust it by simply tearing out pages until you get to the weight that suits you. I should warn you that this process is irreversible so you do need to take care. If in doubt consult a qualified Tree surgeon. That’s in regarding the LONAP byod strategy. Lots happening in the Autumn. Stay tuned for loads more useful tips’n stuff though not necessarily anything to do with LONAP’s byod strategy. LONAP is a Global top 20 Internet Exchange. Read about them here. Also loads of LONAP content on this site – check it out here. Home broadband deals – how to choose?